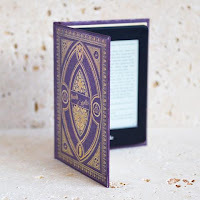 I am delighted to be taking part in the blog blitz for Thorne Moore's latest novel, Shadows, with an extract and my review. So before I tell you what I thought of the book, here's a little extract to whet your appetite. The happy equilibrium is disrupted by the arrival of Sylvia’s sadistic and manipulative son, Christian - but just how dangerous is he? I could tell from the dark, moody cover that something disturbing was lurking within the pages of Thorne Moore's new novel, Shadows. I love anything with a paranormal edge to it, so I was completely intrigued by Kate's ability to feel 'death' and how she copes with her 'gift'. 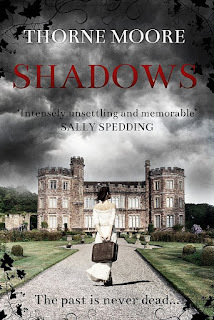 Shadows is another compelling read from Thorne Moore and I find myself looking forward to whatever deeply atmospheric delight she might have up her sleeve for us next. As if Kate and Sylvia don't have enough to contend with, Sylvia's son, Christian, keeps turning up like a bad penny. He spits his venom in every direction, alienating his family and making them afraid of his violent threats. He appears to be at the root of all their troubles and Kate is shocked when she starts to get the feeling that she wishes he was dead. When Kate senses another death, and Christian can't be found, she is overcome with guilt and feels as if she is the harbinger of death. Thank goodness for Al, the new age traveller who is helping to restore Llys y Garn; he keeps Kate grounded and provides her with a little bit of comfort, but he is as deep as the ocean and has his own secrets. Could Al have done something to Christian to protect Kate? 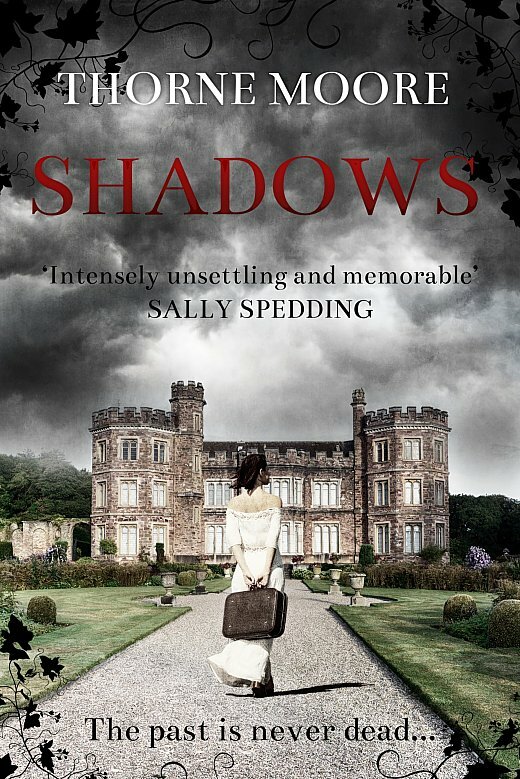 Shadows is so very compelling; it has a bit of everything: a dysfunctional family, secrets and lies, dead bodies and a bit of paranormal activity. It's so very dark, brooding and atmospheric: I felt as if I was roaming the Welsh hills and breathing the fresh country air myself. If you've not discovered Thorne Moore yet, you're missing out on a treat. Thorne was born in Luton and graduated from Aberystwyth University (history) and from the Open University (Law). She set up a restaurant with her sister but now spends her time writing and making miniature furniture for collectors. She lives in Pembrokeshire, which forms a background for much of her writing, as does Luton. She writes psychological mysteries, or "domestic noir," and her first novel, A Time For Silence, was published by Honno in 2012. Her second Motherlove, was published in 2015 and her third, The Unravelling, came out in 2016. A collection of short stories, Moments of Consequence, came out the same year. She's a member of the Crime Writers Association.